Our social media marketing software helps your business get results from social. Grow your following, boost engagement, and win sales. Easily. With less hassle. 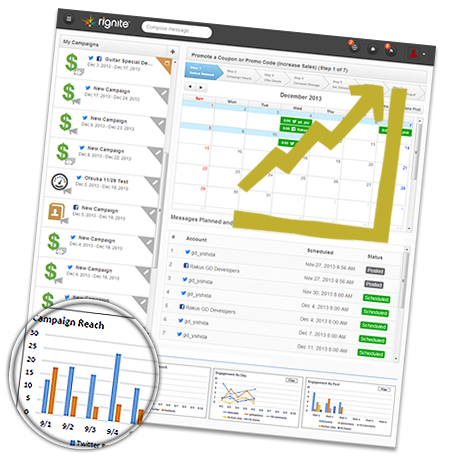 Rignite provides a rich set of social media marketing, monitoring, management and analytics tools. Create social marketing campaigns and manage daily social media activities from a single solution. We make it easy to stay organized and on top of everything. Campaigns - Run a Facebook giveaway or Twitter contest. Promote your blog with evergreen content. Run a coupon campaign to increase followers or sales. See analytics on your series of posts to find out what's working, and what's not. Monitor - Monitor social media networks, keywords, and influencers to engage and respond on social. Curate content easily by monitoring blogs and RSS feeds. Customize the social media monitoring module to keep track of important social activities. Schedule - Get the power tool to keep your social profiles filled with compelling content. Manage your entire posting calendar as an individual or as a team. Import and export posts for efficient scheduling, reporting, and approvals. Dashboard - Get the social media analytics and insight into how your activities are paying off. Compare social campaigns against each other to determine what techniques get broader reach or higher social actions such as clicks, shares, and likes. Download reports for management or clients. Cases - Don't drop the ball on important social responses. Assign cases to yourself for follow up or other team members to get timely responses. Contacts - Keep track of influencers, engaged users, VIPs and other important social contacts so you know how to respond or reach out to them. 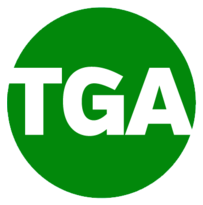 Gallery - Store your library of important photo's and other frequently used assets for you and your team. "Rignite has managed to build a system that has become the hub of our entire social media effort. We're very impressed and very happy with both the product and the team behind it." "The campaign was good and the Rignite Campaign experience made it flawless and efficient for me. I love that feature!" "Rignite allows us to easily and “under one roof” develop, implement and analyze results for our client’s campaigns. We love Rignite!" "Rignite made 24/7 contact with customers on social media easier than ever. In 2 months, we’ve almost doubled our Twitter followers, and that’s now reflecting in our sales!" "Rignite's campaign analytics has made it possible for my agency to test and prove which campaigns are most effective, driving better results for my clients and higher retention in our business model." "I like that Rignite is a comprehensive social media marketing solution. It's helpful to have one control panel to manage different social accounts. Discovering and tracking influencers are simple and help me grow my business." Find out why our customers choose Rignite over the competition. Read Rignite reviews to discover why businesses, agencies, and bloggers love us. Check out these successful social media campaigns to see how others are getting results by using Rignite.